Disney has released the first official movie poster for “The Muppets,” and although slightly creepy, I think it looks great. Dead center we have everyone’s favorite amphibian, Kermit the Frog, then, starting from left, are Gonzo, Fozzie, Miss Piggy and Animal (who still looks like he needs a dose of Prozac). It’s been nearly twelve years since we’ve seen the Muppets on the big screen, yet their popularity has never waned. In fact, because of recent videos from MuppetStudio, such as the highly amusing Bohemian Rhapsody — which incidentally is at an astounding 20 million views on Youtube — they’ve remained relevant. I have a feeling similar gems are in store for us this fall when the film opens. 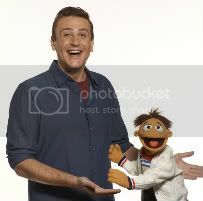 Writer/star Jason Segel (of “How I Met Your Mother Star”) told USA Today the Muppets will be seen in a different light. This makes me all the more excited. Think about it. Could we be in for an awesome Muppet action sequence? Miss Piggy doing martial arts perhaps? Given the above quote, I’d say the possibilities are endless. If that doesn’t pique your interest, the cast will. Amy Adams, Chris Cooper, Emily Blunt, Zach Galifianakis and John Krasinski are in the cast (surrounded by plenty of star cameos) and with James Bobin of “The Flight of the Conchords” fame directing, “The Muppets” is sure to be an enjoyable film. Just in case you’re not clued in on what the main plot is about, here is the official synopsis. On vacation in Los Angeles, Walter, the world’s biggest Muppet fan, and his friends Gary (Jason Segel) and Mary (Amy Adams) from Smalltown, USA, discover the nefarious plan of oilman Tex Richman (Chris Cooper) to raze the Muppet Theater and drill for the oil recently discovered beneath the Muppets’ former stomping grounds. To stage The Greatest Muppet Telethon Ever and raise the $10 million needed to save the theater, Walter, Mary and Gary help Kermit reunite the Muppets, who have all gone their separate ways: Fozzie now performs with a Reno casino tribute band called the Moopets, Miss Piggy is a plus-size fashion editor at Vogue Paris, Animal is in a Santa Barbara clinic for anger management, and Gonzo is a high-powered plumbing magnate. 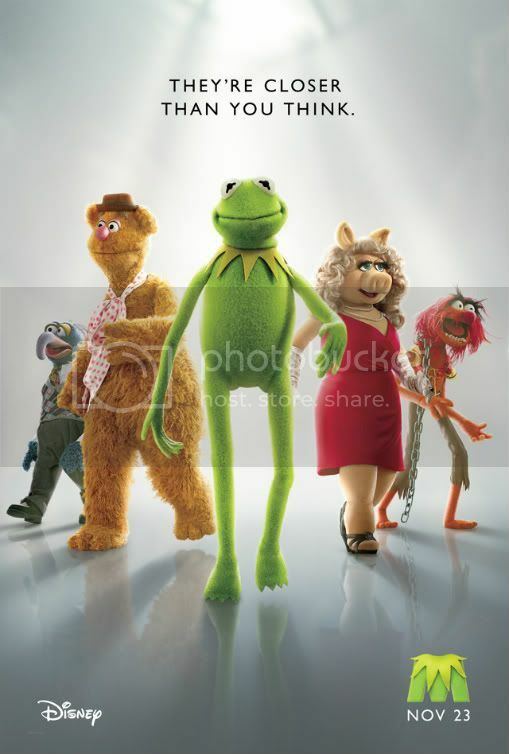 With secret, signature, celebrity cameos, “The Muppets” hits the big screen Nov. 23. Animal in anger management? Fozzie in a Reno casino tribute band and Miss Piggy as what sounds like a character similar to Meryl Streep’s Miranda in a “Devil Wears Prada” makes me wish Nov. 23 was here already. Thank goodness I have Bohemian Rhapsody to tide me over. Sound off to the right with your opinions on the new poster. Do you like it? Is it kinda creepy or am I reading into things as I usually do? The Muppet feet are def a little creepy but I absolutely cannot wait for this movie! Can’t wait for the muppets. The tagline makes them sound like swingers.